On Scotland's superb western coast an experienced skipper can charter a yacht. www.SailScotland.co.uk is an excellent site for all kinds of information about sailing in Scotland. There are dozens of agencies to choose from. 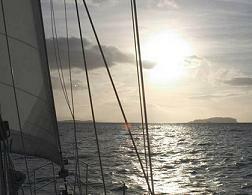 For the less experienced it is also possible to enjoy the thrills of sailing as part of a crew. May is probably the best month to begin, but you can begin as early as April if the weather is favourable. Great inland sailing can be found at Loch Earn, Loch Lomond and Loch Morlich. 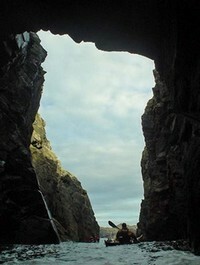 There can be no better way to explore the Scottish coast than by a sea kayak..the caves and inlets will keep you engrossed for ever, and the little beaches you come across are a delight to explore. The idea of surfing in Scotland has more than likely never occurred to the majority of visitors to Scotland. Yes, the water can be chilly, around 13 degrees Centigrade in summer..so you will probably need a wetsuit! I never used one a child, but then again I didn't stay in the water that long! Some of the best surfing is to be found in Lewis in the Outer Hebrides..their website is www.hebrideansurf.co.uk. Dunnet Bay,(by Thurso) and Pease Bay in East Lothian are also recommended for excellent surfing. The best waves are during September and October. This map shows the best surfing beaches. If Windsurfing is your favourite pastime, contact the Scottish Windfsurfing Association for the best sites throughout Scotland. The Scottish Water Ski Centre can give you all the information you need about waterskiing and the best lochs to ski on.